We wish to bring “power to the people” through a three-step community technology plan. to fix problems through unity of families. We spoke to the Minister of Families and he is looking forward to this proposal. to encourage, teach, and equip young women with powerful technology to be used for good. We believe women bring balance to lead the world in a positive direction. National Security requires us to bring this project to the Canadian Space Agency, where we are aligned with http://www.scienceforpeace.ca efforts. STEM STAR represents hope with a plan. We acknowledge the passing of Carrie Fisher, Rebel Princess, a symbol that one brave young woman can make the difference. The idea is for families to have a safe environment to learn, discuss and solve practical community issues through disruptive high-tech, and share these solutions with our politicians to bring helpful change. An example of disruptive high tech is the combination of blockchain + cleantech energy + Aerospace. This led us to our conference. STEM STAR turns Girl Power into Star Power as a master community program accelerating Gross Domestic Product (GDP). 3. in a hybrid corporate startup model, to solve our long-standing issues. The startup model is meant to leverage a financial blockchain Artificial Intelligence (AI) self-funding startup case study. STEM STAR creates a socio-economic sustainability framework, bridging the gap. STAR = Spacetime + Aeronautics + Robotics. Participants act as spokespersons with the University of Waterloo inspired co-op work term reports. These reports act as a creative proposal to encourage startups aligned with Federal Minister mandate letter corporate community goals. This design is meant to create the best opportunity while creating the next generation of women leaders. The approach is a professional community supported roadmap to encourage character driven economically relevant STEM, seeking out the best case studies, for example, a financial blockchain Artificial Intelligence (AI) self-funding startup case study. STEM STAR’s goal is to advance the financial relevance of young women in leadership in community and business, as found in Forbes’ increasing profit article. Our hypothesis is as follows. 5. Jobs that are sustainable, stimulating, and meaningful. STEM STAR builds character through action based on outcomes that matter to families, from our youth’s perspective, to bring us closer as a multi-cultural community through a character community inspired sustainability formula for unity. The STEM STAR call-to-action is a return to a family inclusive, gentlemanly, “ladies first” approach. This approach guided the creation of 10 spiritual monetization codes. STEM STAR spiritual monetization codes symbolized by an artist’s impression of a four-dimensional dali cross, whose mathematics led to the (C2) Blockchain stock exchange startup case study. STEM STAR focuses on the social, economic, and environmental tri-formula, an algorithm for sustainability, integrating character (B.) and STEM (C.) to achieve positive results. STEM STAR increases faith in oneself, through self-recognition of principled belief systems, as a form of love, protecting and popularizing that which is good, just and beautiful. Kindness as a root of sustainable happiness is a strength we take responsibly to nurture. STEM STAR champions productivity and peace through awareness, education, and self-enforcement. STEM STAR advances the market value of participants through hands-on extracurricular learning projects combining ICBM law of civility inter-cultural safety protocol (C2), and IMSG advanced technology. STEM STAR works to achieve United Nations goals locally. An example is the United Nations Sustainable Development Goal #7: “Ensure affordable, reliable, sustainable and modern energy for all” to lower the cost of energy for Ontario families forced to choose between food and power, by educating local administrative leaders on immediate local humanitarian Return On Investment (ROI) opportunity by applying space applicable power technology (C4), here at home, for example, electrifying the rural community*. STEM STAR creates legacy via spiritual lens of family value holistically rooted in physical and spiritual health. Collectively this forms a multi-cultural productive karma, as a deployable emotional intelligence creating an enlightened approach to unlock individual, group and cultural value (C1). STEM STAR incentivizes unified behavior for rapid economic growth. The method is by way of elite, positive social pressure, through the inspirational characteristics of youth, empowered by emerging next generation military-grade technology know-how (C1-C8). STEM STAR represents a modern day approach to unify and advance socio-economic well being, through extracurricular application of multi-domain best practices from advanced business technology support (e.g. blockchain stock exchange startup case study (C2)). STEM STAR advances a dual wealth and next-generation job creation roadmap. This roadmap commercializes space technologies applied on earth**. STEM STAR continues to formula-ize the precedent set by the Jean Vanier Catholic High School Scholastic Valedictorian Engineering Society extracurricular project proposal on power and flight technology, embracing the belief that a disciplined focus on science and philosophy, helps discover truth as the marriage of western science and eastern spirituality supporting a karma responsibility movement, as per Hinduism, Buddhism, Jainism, Sikhism, and Taoism origins of karma, deploying the Canadian Mosaic. Continuing at the University of Western, these extracurricular projects bridge regional goals bearing community spirit, to accomplish international goals of investors, industry, and the Canadian Space Agency (CSA)**. An example is Parliamentary Aerospace Caucus Chair Richmond Hill MP Leona Alleslev’s 150 year outlook support for York Region’s Vision 2051 regional goals. STEM STAR bridges the gap to City of London regional goals through MP Kate Young’s acknowledgement of the 2020 NASA Mars Mission University of Western student participation international goal. ** The Canadian Space Agency President and CEO states, “a focus on the needs of end-users and the integration of the technology in terrestrial application”, as per STEM STAR Codes #A5, and #A9. Success in executing future NASA space missions will depend on advanced technology developments that should already be underway. STEM STAR technology is aligned with NASA’s Strategic Space Technology Investment Plan (SSTIP), which includes a roadmap. 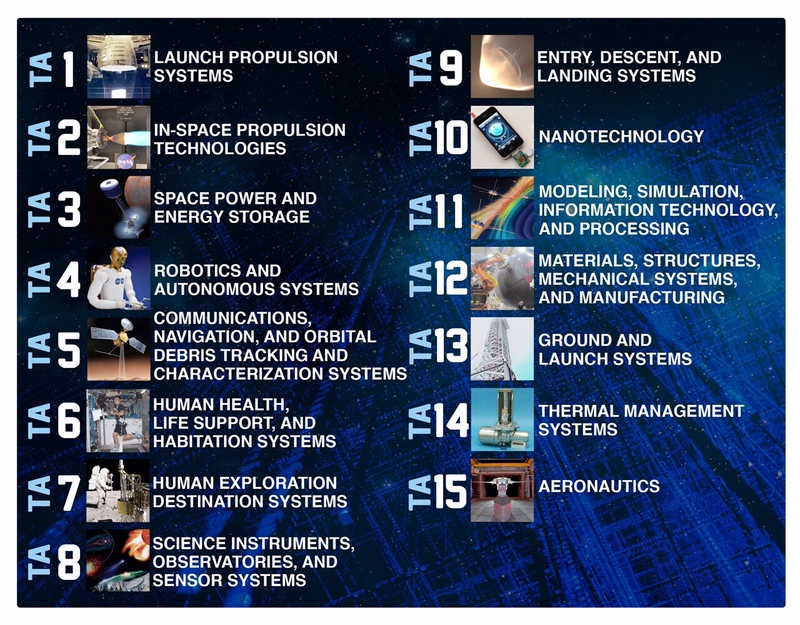 Here is the NASA Technology Roadmap found in the NASA SSTIP. The STEM STAR technology builds on IMSG project management, systems engineering, and coding framework for advanced space technology. This technology was inspired by Star Trek, developed for a Lockheed Martin Skunkworks suborbital platform project. This is the background to a year 2000 self-funding startup achieving a 2016 $6 trillion milestone as an investments data and practice management analytics software solution for investment brokers, in the form of a Microsoft DOT NET Software As a Service (SaaS) private business blockchain “quantum correlation” experiment. In 1989 Bill Gates’ University of Waterloo visit triggered an application of a quantum algorithm simulation in the form of a security and securities themed Artificial Intelligence (AI) trading platform awareness, education and enforcement Watchdog as a software sentinel (Bully Watch), for the purpose of advancing an incivility to innovation economic algorithm, founding Intelligent Market Solutions Group www.imsg.ca. The first commercial field test of the Watchdog algorithm was a 1989 Toronto Stock Exchange to London Stock Exchange inter-listed multi-exchange secure intelligent programmable block trade chain of contracts “smart block chain” implementation of Investment Industry Regulatory Organization of Canada (IIROC) 1987 Black Monday spawned Watchdog sentinel project. The Watchdog algorithm evolved through a CSIS counter-terrorism anti-money laundering (AML) agent training and field operation, bearing Defense system cross-over through the nuclear-powered aircraft carrier U.S.S. Enterprise shipbuilding conglomerate Tenneco Inc. Tenneco’s Canadian world-wide data “double spending” ledger audit triggered a data mitigation project built around Tenneco Canada’s #1 worldwide ranked sales and robotic engineering team, resulting in a hybrid revenue management and project management (Revenue Project Management) Enterprise Project Management (EPM), Enterprise Resource Planning (ERP) hybrid system, accelerating Return on Investment (ROI) as an intermediate system used to protect the Canadian operations efficiency as an interface the new global implementation of SAP. The year 2000 PriceMetrix experimental startup was proposed to and funded by Canada Revenue Agency (CRA) as a Scientific Research and Experimental Development (SR&ED) sociology experiment based on a scenario found in the popular Star Trek TV series. The Star Trek AI road map’s attempt to solve the theoretical Multitronic human engram scenario to add feelings to an AI failed with a rjection. In this CRA SR&ED experiment, the rejection issue via “adaptive network” to understand and correct “guilty behaviour” through a peer-to-peer transparency system imprinting the PriceMetrix CEO double law of integrity, with IMSG’s IIROC self-regulation mandate enforcement and broker education coding. This combined character development in the form of economic behaviour management (C2) with a training and development formula formalization as a SR&ED proposed rapid iteration project management method, giving rise to Revenue Project Management (T1) and “smart pseudo-blockchain” (T3) coding to systematically change full service retail investment broker behaviour. The combination of (T1), (T2), and (T3) created the self-learning neural network behavioural pattern-recognition engine, as a hypercube based synaptic Application Programming Interface (API) model through a Microsoft Excel X-Cube* quantum algorithm simulation combining SQL and extreme subscripted variable based matrix vector calculus (function of matrix calculus and vector calculus) to exponentially increase trading data analysis throughput. *The X-Cube is an X-dimensional cube application of Hilbert space. Extended experimentation of the X-Cube mathematics applying string theory to quantum information theory helped yield C4 Quantum Fusion. Theorized combination of X-Cube and Quantum Fusion technology includes “instant” quantum entanglement based data communication and data locking proposed for high value communication and sensitive data (e.g. currency, voting ledgers, parsec telecommunication) as an extension of secure, efficient information processing and transfer technology in the form of an attributed blockchain to the power industry leading to the quantum blockchain. (Quantum relates to the 1801 Thomas Young double-slit experiment aligned to a UW St. Jerome’s philosophy course). Here is a set of technology with proposed STEM STAR application mapped to NASA Technology Roadmap. T1. The Formula for Professionals is a socioeconomic algorithm derived from an unpublished University of Waterloo St. Jerome’s, Mathematics and Economics department unification theory. The template finds the people, process, system “sweet spot” through public speaking (people), revenue project management (process), and Project Management Office (PMO) Command and Control system programmable office technology (system) that manifests emotionally intelligent behaviour. T1 applied T2 creating a pseudo-blockchain stock exchange startup case study (C2). This corresponds to NASA Technology Roadmap item TA4 – Robotics and autonomous systems. T2. Bully Watch Incivility Management program is human rights technology as a physical and mental safety system to permit economic growth via awareness, education and enforcement. Civility is achieved through an anti-corruption self-correction formula. This is proposed as a United Nations (UN) inter-cultural protocol to identify in-person and electronically transmitted harm, deploying the Premier McGuinty initiated court authorized CAMH comorbidity leadership training. T2 was applied by T1 to create a pseudo-blockchain stock exchange startup case study. This corresponds to NASA Technology Roadmap item TA6 -Human Health, Life Support and Habitation systems. T3. Energy Trading Heuristic – Blockchain Banking Security makes money by combining Blockchain Application Specific Integrated Circuit (ASIC) cyber currency network of mining servers (e.g. Bitcoin*) related to T4 and T5 next-generation energy infrastructure as an energy trading heuristic. This corresponds to NASA Technology Roadmap item TA11 – Modeling Simulation Technology and Processing. *The market cap for Bitcoin exceeds the market cap of some countries. This corresponds to NASA Technology Roadmap item TA3 – Space Power and Energy systems. * IMSG “Cold Spark” muon catalyzed quantum spin liquid fusion R&D (seeking independent muon spin spectroscopy lab verification of condensed matter in the form of stable Quantum Spin Liquid) in line with the Government of Canada’s Nov 21, 2016 pledge to accelerate investments in clean electricity. T5. Bioreactors – Algae Biofuel and Bioplastic technology is a bioecology sustainability system through solar panel algae fed bioreactors to generate biofuel (standard and biomass), and bioplastics, while recycling waste (e.g. Carbon Dioxide). This corresponds to NASA Technology Roadmap item TA6 – Human Health, Life Support and Habitation systems. Stage 2 Mach 24-33 Orbital class hydrogen fueled ion drive. This corresponds to NASA Technology Roadmap item TA1 – Launch Propulsion Systems. *Impulse is the amount of thrust delivered per unit mass of rocket fuel. T7. Fusion drive and structural integrity mitigation theory is Stage 3 Earth/Mars class TAP* fused-plasma fueled fusion-drive, deploying superconducting magnet vectoring, as a nuclear engine design. This corresponds to NASA Technology Roadmap item TA2 – In Space Propulsion Systems. T8. Nuclear recycling nanotechnology theory converts nuclear waste into hydrogen and oxygen to clean up communities deploying traditional nuclear technology. This corresponds to NASA Technology Roadmap item TA10 – Nanotechnology. STEM STAR youth efforts to deal with mental health, and increase family confidence, began with MP Majid Jowhari’s support of Jean Vanier Catholic High School certificates of recognition to youth and the Bully Watch program created to help mitigate negativity amplifying socio-economic benefit of those who demonstrate responsibility. The youth certificates were a follow up of an Oct 3, 2014 speech by student Michael D’Silva organized with the help of Joshua and Brianna D’Silva, on behalf of Federal Liberal Party of Canada Member of Parliament Candidate Majid Jowhari who was attending the Global Citizenship Forum, a summit of International Prime Ministers, where Jowhari promoted Jean Vanier Catholic High School. The speech was attended by Superintendent of Education: School Leadership (former Charter Principal) Ron Crocco, Principal Frank Dalla Corte, York Catholic District School Board Director of Education Patricia Preston. Department Head Canadian & World Studies/Family Studies Teacher Mr. John Warecki and Civics Teacher Ms. Cynthia Bettio initiatives encouraged Jean Vanier Catholic High School student volunteerism in the federal elections. The speech recognized the 2014 York Region Character Community “School of Character” plaque. The “School of Character” plaque nomination stemmed from student initiatives like Bully Watch for Students, which came from a 2012 York Region Catholic District School Board School Safety anti-bully pilot program developed at Corpus Christi Catholic Elementary School relating to the teachings of Jean Vanier expressed in his book “Becoming Human”. Jean Vanier Catholic High School “School of Character” plaque mounted under a quote from “Becoming Human” by Jean Vanier, which encourages student participation with politicians and corporations, the trifecta from which STEM STAR is built. Brianna and her two brothers founded the character component of STEM STAR, solidified by MP Majid Jowhari’s acknowledgment speech at the April 6, 2016 Bully Watch press conference. Dec 3, 2016, Samantha Hawko declared STEM STAR to Aurora—Oak Ridges—Richmond Hill Member of Parliament Leona Alleslev at the MP’s Holiday Party. Jan 19, 2017, MP Leona Alleslev’s office hosts a seven person STEM STAR thinktank. March 14, 2017, The Honourable Jean-Yves Duclos, Minister of Families, Children and Social Development acknowledges MP Leona Alleslev’s Constituency Youth Council, initiated by the MP acknowledging her Constituency Youth Council leaders [Brianna D’Silva and Samantha Hawko] from mention of Dave D’Silva’s [STEM STAR] youth and family proposal mirroring the Minister’s family confidence, innovation and job theme. March 14, 2017 Richmond Hill Country Club,Richmond Hill –Richmond Hill Board of Trade (RHBOT) event atte4ndees (left to right( MP Majid Jowhari, RHBOT Government Affairs Committee Chair Randall Becker, Aurora-Oak Ridges-Richmond Hill MP Leona Alleslev; The Honourable Jean-Yves Duclos Minister of Families, Children and Social Development; Vaughan-Woodbridge MP Francesco Sorbarra, Richmond Hill Board of Trade Executive Director Elio Furlan. The Honourable Jean-Yves Duclos and Dave D’Silva speak about family value led programs. March 14, 2017 The Honourable Jean-Yves Duclos, Minister of Families, Children and Social Development and Dave D’Silva at the Pre-Budget 2017 Meeting with Richmond Hill Business Community, Richmond Hill Country Club, Richmond Hill. President Meric Gertler opened the U of T Sustainability Summit event to inspirational speakers like Ontario Minister of Research, Innovation and Science Hon. Reza Moridi who announced the Solutions 2030 Challenge relating to transformative clean technologies to help fight climate change. April 13, 2017, MaRS, Toronto — Dave D’Silva and Dr. Reza Moridi discuss the Ryerson Aerospace quantum fusion clean energy update at the U of T Sustainability Summit. Nov 17, 2017, St. Theresa of Lisieux (STL) Catholic High School, Richmond Hill — STL Robotics team VEX competition robot inspires STEM STAR quantum fusion battery powered Mars lander conference. High School students scouted for proposed advanced standings in Aerospace programs like the York University Space Engineering program. Nov 17, 2017, St. Theresa of Lisieux (STL) Catholic High School, Richmond Hill — STL Robotics team left to right, Anthony Ganuelas, Christina Summers, Samantha Hawko, Austin Huang, Ali Raeisdanaei and Artur Kuramshin represent the STEM STAR Quantum Fusion AI Blockchain Space Robotics Student Team. Dec 13, 2017, York University, Toronto — The BlockChain Hub Strategic Initiatives (C-Lab) Lead Mohamed El Kandri and Dave D’Silva discuss a girl-friendly blockchain conference for Richmond Hill’s St. Theresa of Lisieux (STL) Catholic High School Robotics STEM STAR team. Parliamentary Space Caucus Chair MP Alleslev awaiting date confirmation of the STEM STAR conference plan supported by Microsoft, York University The Blockchain Hub and the CryptoChicks. Dec 16, 2017 The Diamond Back Golf Club, Aurora — STEM STAR conference update with Dave D’Silva, Samantha Hawko, MP Leona Alleslev, and Anita Hawko (left to right). Tom Rand asks Dave D’Silva for support on how blockchain can help climate change after Dave mentions how Tom’s “Waking the Frog” Solutions for Our Climate Change Paralysis” societal factors could be overcome deploying a blockchain behavioural system case study. March 13, Alex Makarski and I dropped by ThatChannel.com studios then Ryerson Aerospace Engineering and Ryerson’s Centre for Urban Energy. First we visited Ryerson Aerospace Dr. Kumar, who is willing to support the potential for cheap energy through Canada’s quantum fusion energy project. Dr. Kumar, Alex and I discussed energy blockchain as an analytics tool. Our vision is support of the Canadian Space Agency for the “Artificial Intelligence and Big Data Analytics for Advanced Autonomous Space Systems” call for solutions by Innovation, Science and Economic Development Canada, found here. We found Dr. Kumar former student and SWTCH Business Development Director Thomas Martin at the Ryerson Centre for Urban Energy (CUE) Clean Energy Zone. SWTCH is an incubated electric vehicle (EV) charging management solutions firm. We believe SWTCH could be a use case for peer-to-peer energy support through blockchains like www.ipowercoin.com (iPC). iPC investor use case includes firms like SWTCH, as energy asset germination fractional investment and ownership via smart contracts. SWTCH provides electric vehicle (EV) charging management solutions for multi-unit residential, workplace, and public destination settings. Our innovative EV charging management platform optimizes charger usage to benefit charger providers and drivers. Platform features include charger usage enforcement, simple billing, smart energy management, and OCPP compliance. SWTCH is committed to improving EV charging accessibility in order to realize the social, economic, and environmental benefits of widespread electric vehicle adoption (reference). March 13, 2018, left to right: Alex Makarski, Thomas Martin, and Dave D’Silva. April 3, 2018, Sherimineh introduced Alex and I to Ann Cavoukian, a Privacy by Design (PbD) expert. PbD is inherent in blockchain, and the heart of the reason for our http://www.ipowercoin.com energy blockchain anti-fraud use case to use with quantum fusion. Our conference is designed to increase thinking as per Einstein’s quote: The significant problems we have cannot be solved at the same level of thinking with which we created them. Welcome to “The friendly robot” high tech high school conference for blockchain and AI to facilitate climate change breakthroughs in cleantech. We will hold a series of private high school conferences, in 2018 Q2, then open to the public at York University. Welcome to the development of our youth. We believe they are key to solve adult problems. Our approach is family value guided deployment of exciting R&D prototypes. We acknowledge the 100 youth of Richmond Hill’s St. Theresa of Lisieux (STL) Catholic High School robotics and AI team members. Student co-founder Samantha came up with “The Friendly Robot” name. Samantha realized that sentient software (“bots” made up of blockchain and AI) should be friendly, not attack us, therefore avoiding the Skynet Terminator scenario. R2D2 is our symbol to develop a sentient AI by having it guided by a moral duty. If the morality of the AI is guided by a duty, what better duty than saving the world? We partnered with University of Toronto Science for Peace to orient our technology to mitigate the Six Crises, which includes global warming, through their Platform for Survival. We are honoured to present at their May 30, 2018 How to Save the World in a Hurry Science for Peace Conference working with Peace Magazine to bring a policy to the UN. Our case study observation is doing good creates economic value by eliminating negative behaviour. 3. help eliminate social and economic discrepancies, converting negative behaviour into positive for economic gain. We believe this human rights technology approach will bring about a human rights economic engine. expand on a natural, sustainable, human rights economic incentive system. Incentives for regular families is our realistic start to these lofty goals is. Conference participants learn of, contribute, and participate in a “Power to the People” self-funding energy blockchain ecosystem to solve problems like high power bills and climate change. We acknowledge Don Tapscott’s 2018 blockchain prediction #”9 The social impact–breakthroughs on energy and climate change“. “the friendly robot” conference delivers hope. This conference is put together so families learn about exciting technology to solve practical issues of expense, revenue, and climate change, through development of robots with moral AIs, advanced power, and, to show off, advanced flight systems. Learn about A, B, and C.
2. reduces climate change through energy blockchains*. 3. future compact cold flow / ion impulse rocket propulsion systems for R2D2 to fly. Ryerson Aerospace cold flow rocket motor inspires us as a potential system retrofit for quantum fusion powered propulsion. leads us to the possibility of another Starship design. Whereas there are expected design iterations between the current aircraft carrier named Enterprise and the beloved Star Trek Enterprise, it is important to be clear on the future we want. Feel free to join me on LinkedIn, where STEMSTAR connects to the Energy Cloud Neural Grid “catch all” portfolio of projects through the Emerging Technology Framework to Unite Society Enterprise Project Management Office.